Simma’s is here to make your wedding dreams come true. We will work with you to design the perfect wedding cake. We welcome suggestions and encourage you to bring pictures and ideas of your own. 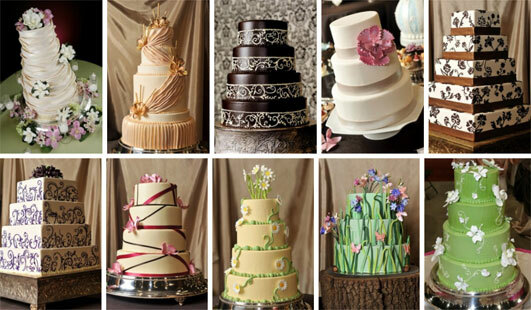 Please call (414) 257-0998 to set up an appointment with a wedding consultant and sample our delectable cakes. We take appointments Tuesday through Friday from 9:30 am to 5:00 pm and on Saturday from 9:30am to 4:00pm. You can try up to four samples, to help you decide, please take a look at some of our more popular options. If you wish to order a tiered wedding cake, we ask that you please call to make an appointment. Thank You. Any tiered cake that feeds 100 people or more includes a complimentary Anniversary cake. This will be the top tier of your cake. Our Classic cheesecake, it comes with a chocolate cake base, a thin layer of raspberry filling and is covered in our own chocolate ganache. Genoise cake with vanilla mousse and fresh strawberries between the layers and covered in white chocolate ganache. Marble cake with a raspberry filling and a thin layer of butter cream and topped off with our French butter cream. Marble cake with raspberry mousse filling and topped off with our French butter cream. Chocolate cake filled with chocolate mousse and covered with chocolate ganache. Carrot cake with cream cheese filling and topped with butter cream frosting. Genoise cake with a raspberry Chambord liquor mousse and fresh raspberries and covered with white chocolate ganache. Red velvet cake with a cream cheese filling and topped with butter cream frosting. Butter Cream, Chocolate Butter Cream, Chocolate Ganache, White Chocolate Ganache. Delivery in the Milwaukee area is $45.00. If your party is outside the Milwaukee area please inquire about the delivery fee. For more information about pricing please give us a call.